Former Liberal Democrat leader Charles Kennedy has admitted that he refused to back his party's coalition deal with the Conservatives. Writing in the Observer - ahead of a special Lib Dem conference - Mr Kennedy said he feared it would wreck plans for a progressive centre-left alliance. His apprehension was shared by some grassroots party members too, he says. Lib Dem leader Nick Clegg, who will address his party later, defended his decision as the only workable option. The new deputy prime minister told the Guardian newspaper on Saturday that he knew the deal had caused "much surprise and some offence" but the coalition's agenda was one of "liberalism". He said he rejected a Labour-led alliance, as it was "unworkable" and would be seen by voters as "illegitimate". 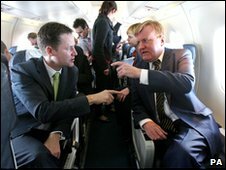 But Mr Kennedy, who led the party from 1999 to 2006, said he could not bring himself to back Mr Clegg in the crucial vote on Tuesday night and now feared the Lib Dems would be swallowed up by the Tories. "With uncharacteristic understatement Paddy Ashdown described last week's events as 'a rather unexpected moment'," he wrote. "Certainly, they drive a strategic coach and horses through the long-nurtured 'realignment of the centre-left' to which leaders in the Liberal tradition, this one included, have all subscribed since the Jo Grimond era. "It is hardly surprising that, for some of us at least, our political compass currently feels confused." Lord Ashdown, another former party leader, has also expressed concerns about the pact. Former Lib Dem MP Dr Evan Harris - who lost his seat to the Tories - backed the coalition. "Yes there are risks for us, people are worried. I think of the options available to Nick and the party, the option of a stable coalition - where we can actually mitigate most of the unacceptable Conservative policies and introduce many of our own progressive policies - was the best of the options available." But he predicted future tensions between the coalition partners over social issues. "There will be tensions when those emerge, and issues to do with Europe and immigration, where it will be difficult for the Liberal Democrats - on immigration, for example - to accept some of the rhetoric." At Sunday's conference in Birmingham, party members will have the chance to question Mr Clegg, and fellow cabinet colleagues including the new Business Secretary Vince Cable and the Energy Secretary Chris Huhne over details of the coalition. BBC political correspondent Louise Stewart said hostile motions were expected to be tabled on issues including tuition fees, the replacement of Trident and increasing VAT. Members would have the right to vote on the coalition deal, but it was unlikely to have much impact, she added.